This sweet and tangy grape “candy” is a delicious afternoon treat and healthy way to satisfy a sugar craving. Kids love to get their hands dirty in the kitchen, and this simple recipe is fun for the whole family to prepare! Plus, it’s an easy way to add more vitamins and minerals to your family’s diet! Mix the yogurt and Calm Specifics Kids together in a medium bowl. Add the grapes to the bowl and toss to coat. Spoon the grapes onto a parchment-lined baking sheet in rows. 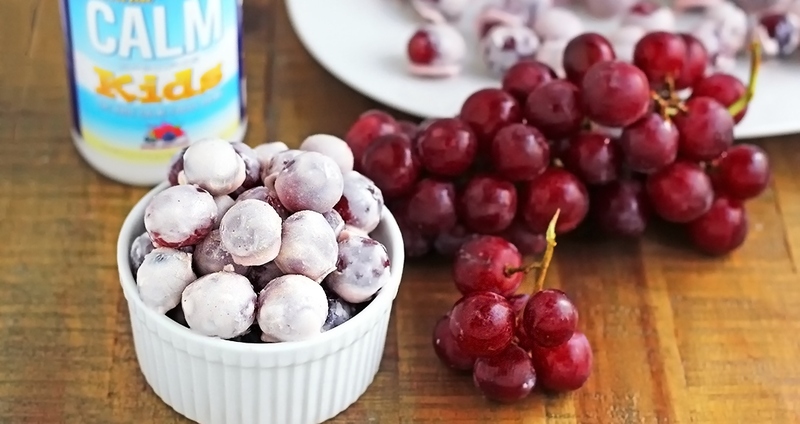 Freeze the grapes for about 30 minutes, or until yogurt is firm. Enjoy! Note: These can be stored in the freezer until ready to eat. If teeth are sensitive to cold, let them warm up for about 5–10 minutes before enjoying.